Sudha (extreme right in the picture), mother of two and a home-maker from Kaluvankadu village in Thiruvarur district of Tamil Nadu, always dreamt of becoming an entrepreneur. Due to lack of livelihood opportunities in their village, Sudha’s husband moved to Dubai and from there, he started sending money every month to the family. However, the amount used to just be sufficient for covering children’s school fees and the medical costs of in-laws, thereby leaving Sudha with barely any savings. As a result, in the face of an emergency, she had to resort to taking loans, which in most cases had to be from the local moneylender and at high interest rates! Sudha joinedParaiMeengal, a collective of 40 women from her village, formed with support from Legal Aid to Women Trust (LAW Trust) and our Tamil Nadu Regional Office under a European Commission-supported project. The members of ParaiMeengal,were given life skills training, women’s rights orientations and vocational skill training in masala powder making and also of dry fish products. In addition, women were also mobilized to be included in the Fisher-people’s Welfare Board which makes them eligible to avail the various government entitlements. 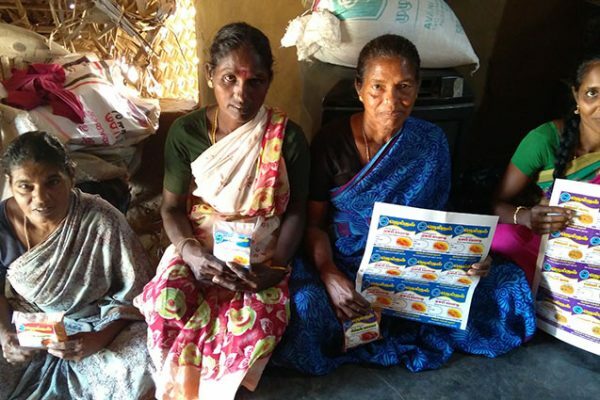 Trained and empowered as an outcome of these trainings, Sudha, along with Seethalaksmi, Muthulaksmi and Amirthavalli, three other women from the collective, started a micro-enterprise for masala powder making. These newly-turned entrepreneurs are today successfully running their unit. “Starting this unit has made us more confident and financially independent. We are now looking forward to widening our market reach,” shared these women jubilantly.